eThe 22q and You Center (T.B.C., E.H.Z., D.M.M.-M.)fDepartment of Human Genetics (T.B.C., E.H.Z., D.M.M.-M.), Children's Hospital of Philadelphia, Philadelphia, PennsylvaniagDepartment of Pediatrics (E.H.Z., D.M.M.-M.), Perelman School of Medicine at the University of Pennsylvania, Philadelphia, Pennsylvania. BACKGROUND AND PURPOSE: The 22q11.2 deletion syndrome is characterized by a heterogenic phenotype, including hearing loss. The underlying cause of hearing loss, especially sensorineural hearing loss, is not yet clear. Therefore, our objective was to describe anatomic malformations in the middle and inner ear in patients with 22q11.2 deletion syndrome. MATERIALS AND METHODS: A retrospective case series was conducted in 2 tertiary referral centers. All patients with 22q11.2 deletion syndrome who had undergone CT or MR imaging of the temporal bones were included. Radiologic images were evaluated on predetermined parameters, including abnormalities of the ossicular chain, cochlea, semicircular canals, and vestibule. RESULTS: There were 26 patients (52 ears) with a CT or MR imaging scan available. A dense stapes superstructure was found in 18 ears (36%), an incomplete partition type II was suspected in 12 cochleas (23%), the lateral semicircular canal was malformed with a small bony island in 17 ears (33%), and the lateral semicircular canal and vestibule were fused to a single cavity in 15 ears (29%). 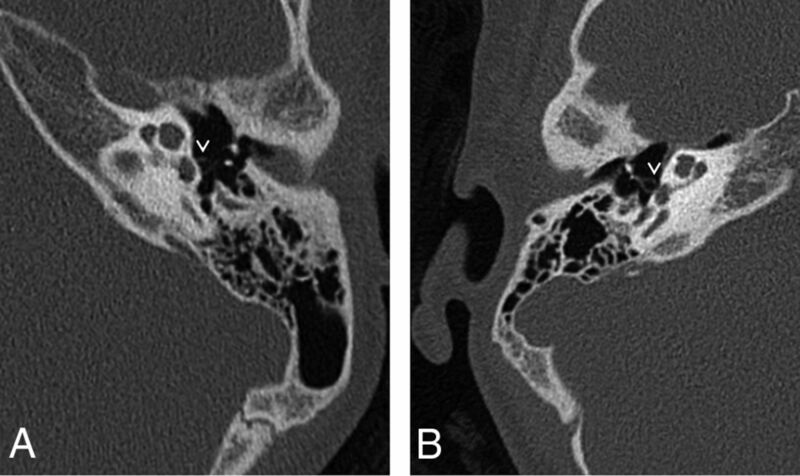 CONCLUSIONS: Middle and inner ear abnormalities were frequently encountered in our cohort, including malformations of the lateral semicircular canal. The aim of this study was to describe anatomic malformations of the middle and inner ear in these patients, shown on CT and/or MR imaging. We conducted a retrospective study at the University Medical Center Utrecht and Children's Hospital of Philadelphia. All patients diagnosed with 22q11DS, confirmed with a microdeletion, who underwent CT or MR imaging of the temporal bones before May 2017 were included. Radiologic images from Children's Hospital of Philadelphia were de-identified and sent to the University Medical Center Utrecht for analysis. Approval from the institutional review board from Children's Hospital of Philadelphia was obtained, and the medical ethics committee of the University Medical Center Utrecht deemed this study exempt from review. The medical records were reviewed to determine the primary reason for obtaining CT or MR imaging and to collect data including pure tone audiogram information. Furthermore, tympanometry information, history of chronic otitis media, and history of dizziness or balance problems were collected. Hearing loss was defined as a pure tone average (average, 0.5, 1, 2, and 4 kHz) of >20 dB hearing level, in concordance with the American Academy of Otolaryngology–Head and Neck Surgery 1995 guidelines.22 Conductive hearing loss was considered when the average air-conduction threshold was >20 dB, and the air-bone gap was ≥10 dB at ≥1 frequency. Sensorineural hearing loss was defined as hearing loss with an air-bone gap of <10 dB in all frequencies, and mixed hearing loss, as an average air and bone conduction threshold of >20 dB and an air-bone gap of ≥10 dB at ≥1 frequency. 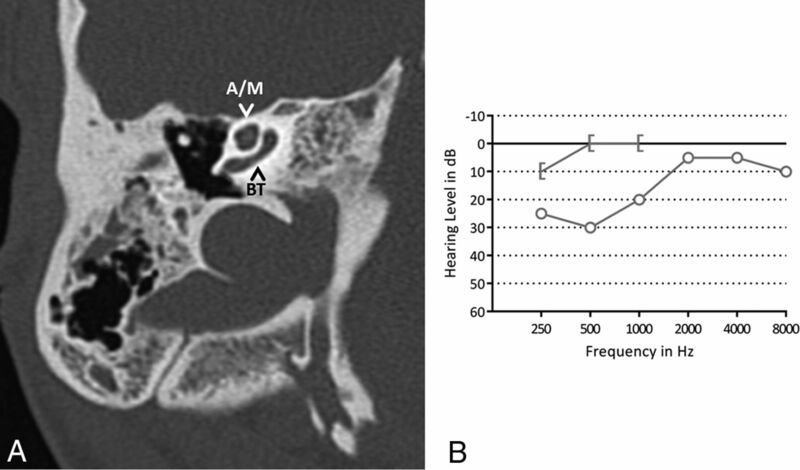 Tympanometry results were classified into type A (representing the normal situation), type B (flat curve, indicating middle ear effusion), type C (negative peak pressure), type As (a small pressure peak, representing a decreased mobility of the ossicular chain), and type Ad (a high pressure peak, indicating an increased mobility of the ossicular chain). Of approximately 300 patients followed at the University Medical Center Utrecht and the 1300 patients from Children's Hospital of Philadelphia, 26 patients (52 ears), 14 males and 12 females, underwent radiologic imaging of the temporal bones (11 patients from the University Medical Center Utrecht, 15 patients from Children's Hospital of Philadelphia). The indications for imaging were hearing loss that could not be explained by otoscopic findings (n = 10), chronic otitis media (n = 13), both unexplained hearing loss and chronic otitis media (n = 2), or aureal atresia (n = 1). MR imaging was performed in 1 patient; all other patients underwent CT of the temporal bones. One patient likely had a second genetic disorder, in addition to a microdeletion on chromosome 22q11.2. Radiologic findings are shown in Fig 1. 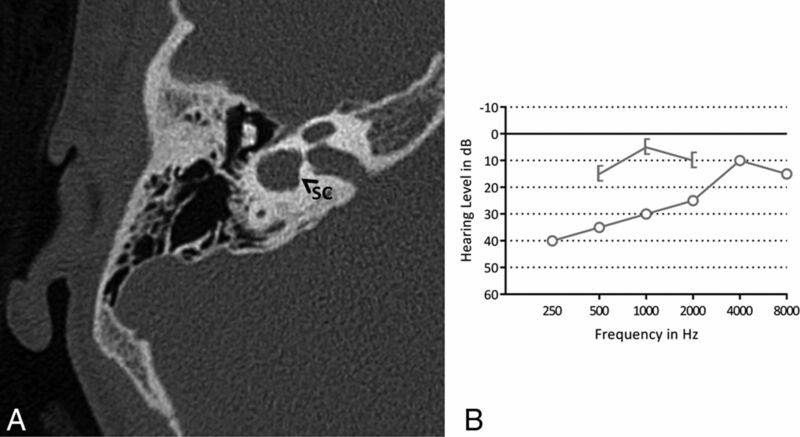 Radiologic malformations of the middle and inner ear encountered in 52 ears. Aural atresia was seen affecting the external auditory canal and middle ear in 1 ear. The middle ear was small and contained 1 rudimentary hearing ossicle. No stapes, stapes footplate, or facial nerve could be identified. This ear belonged to the patient with a possible second genetic disorder. Eighteen ears (36%) (13 patients) were found to have a dense stapes superstructure (Fig 2), and in 2 ears (1 patient), the manubrium of the malleus was dense. No other abnormalities of the malleus or incus were encountered. A, Axial CT image of the left mastoid shows a normal stapes superstructure for comparison with B. B, Axial CT image of the right mastoid shows a dense, thick stapes superstructure. The pure tone audiogram of this patient is shown in Fig 5B. The mastoid bones shown in A and B do not belong to the same patient. Malformations of the cochlea and vestibular system were seen. As shown in Fig 1, an incomplete partition type II of the cochlea was suspected in 12 ears (23%) (7 patients). This malformation was frequently subtle and easy to overlook (Fig 3). A, Axial CT image of the right mastoid shows an incomplete partition type II of the cochlea. The basal turn (BT) of the cochlea is intact; the apical and middle turn (A/M) seem confluent. B, A pure tone audiogram of the same ear shows normal hearing. The circle indicates an unmasked air-conduction threshold; the bracket, a masked bone-conduction threshold. In 17 ears (33%) (11 patients), the bony island of the LSCC was small (Fig 4), measuring between 2.6 and 1.1 mm. No evidence of widening of the vestibule was observed, including in the ears with a small bony island (the widest vestibule measured 3.9 mm). In 15 ears (29%) (9 patients), the LSCC and vestibule were fused to a single cavity (Fig 5). Two patients had an LSCC with a small bony island in 1 ear and a single cavity in the contralateral ear. In addition, in 1 ear with a normally formed LSCC, there was a disruption of the posterior semicircular canal, consisting of 2 blind limbs. 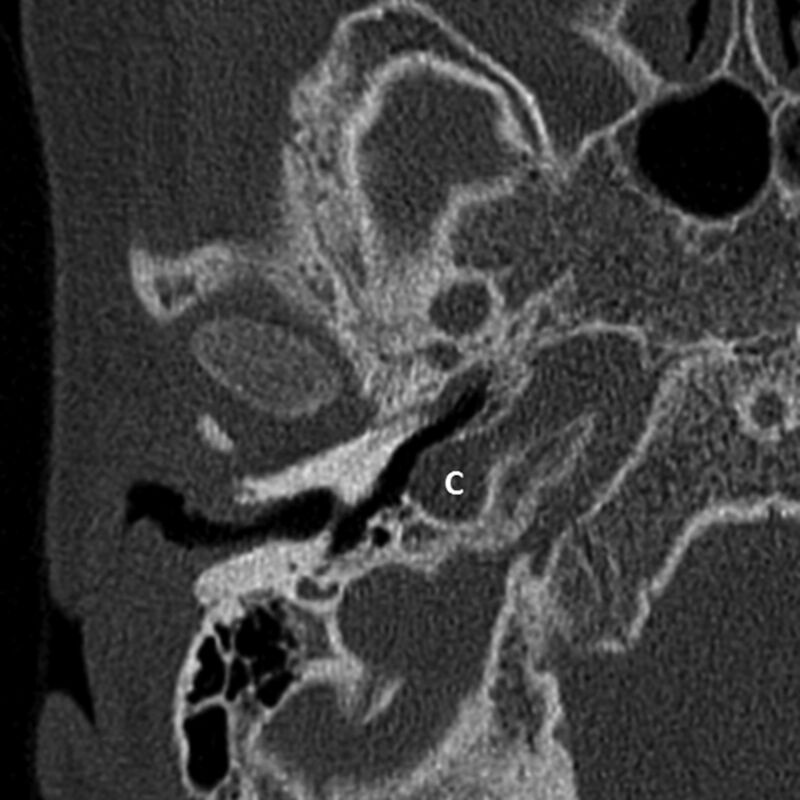 Superior semicircular canal dehiscence was seen in 1 ear. A, Axial CT image of left mastoid bone shows the lateral semicircular canal with a small bony island. B, A pure tone audiogram of the same ear shows a mild conductive hearing loss. The x indicates an unmasked air-conduction threshold; the bracket, a masked bone-conduction threshold. A, Axial CT image of the right mastoid bone. The bony island of the lateral semicircular canal is missing, and the canal and vestibule are composed of a single cavity (SC). B, A pure tone audiogram of the same ear shows conductive hearing loss, more pronounced in the low frequencies. The circle indicates an unmasked air-conduction threshold; the bracket, a masked bone-conduction threshold. Last, in 5 ears (10%) (4 patients), a dehiscence of the carotid canal was present (Fig 6). The vestibular aqueduct and the facial nerve were normal in all cases, except in the ear with an aural atresia, where the facial nerve could not be identified. Axial CT image of the right mastoid bone showing a carotid canal dehiscence (C). Twenty-seven ears belonging to 18 patients showed hearing loss on a pure tone audiogram. Sixteen ears had conductive, 6 ears had sensorineural, and 5 had ears mixed hearing loss. The median pure tone average of the ears with hearing loss was 33.75 dB hearing level (range, 21–100 dB hearing level). In 1 patient, there was no pure tone audiogram available. This patient had undergone a visual reinforcement audiometry and a brain stem evoked response audiometry, which was suspect for a pure sensorineural hearing loss in the right ear and a mixed hearing loss in the left ear. The patient with an aural atresia did not have an audiogram of the atretic ear. The type of hearing loss compared with the encountered anatomic malformations is summarized in Table 1. Tympanometry was performed in 42 ears in 4 ears the test failed, and in the remaining 6 ears, no tympanogram was available in the medical files. A normal tympanogram finding (type A) was present in 18 ears; a type B was present in 5 ears; a type C, in 3 ears; a type As, in 10 ears; a type Ad, in 1 ear; and in 5 ears, a large volume was shown on tympanometry. The tympanometry results from the ears with middle ear abnormalities are shown in Table 1. Of the 12 ears with a dense stapes superstructure and an available tympanogram, 3 ears had a type As tympanogram, indicating decreased mobility of the ossicular chain. Five patients had no history of recurrent otitis media. All other patients (n = 21) had either recurrent otitis media with effusion or recurrent acute otitis media or both. All patients with a dense hearing ossicle had a history of recurrent otitis media. One patient was reported to experience occasional dizziness and another patient showed normal compensatory eye movements when tested for the vestibulo-ocular reflex. The patient with occasional dizziness had an LSCC with a small bony island on one side and a single cavity on the other side. In the patient with normal compensatory eye movements, the vestibule and LSCC were bilaterally fused to a single cavity. We presume that no other patient had vestibular symptoms because these symptoms were not mentioned in the medical records. By pooling data from 2 large centers (University Medical Center Utrecht and Children's Hospital of Philadelphia), we have presented the largest series describing radiographic malformations found in the middle and inner ears of patients with 22q11DS, to our knowledge. In a similar study by Loos et al, 16 CT scans of the temporal bones of 11 patients were analyzed. Table 2 compares the total number of middle and inner ear malformations described in each study. Perhaps the most interesting but incidental finding was when the LSCC and vestibule consisted of a single cavity, as was seen in 29%, and when the LSCC was malformed with a small bony island, present in 33%. From our chart reviews, clinical findings that may have been directly attributed to inner ear vestibular problems such as vertigo or balance problems were not present in those who had a malformed LSCC on imaging studies. Absent vestibular symptoms in patients without 22q11DS with a malformed LSCC were reported in previous studies.30⇓–32 However, more subtle balance problems have frequently been described in the 22q11DS population.33⇓–35 Many of these symptoms can relate to other neuromotor deficits,33 including motor delay36⇓–38 or hypotonia,33,38,39 but vestibular problems could also play a role. Prospective research is needed to assess the possible relation among anatomic malformations of the vestibular system, vestibular function, and motor delay in patients with 22q11DS. A subtle incomplete partition type II was frequently found in our patients. These findings are consistent with those in the study of Loos et al (Table 1).16 An incomplete partition type II of the cochlea derives from a developmental arrest at the seventh week of gestation. Here the cochlea has 1.5 turns, and there is a defect at the apex of the cochlea between the middle and apical turns. The basal turn and basal part of the modiolus are normally developed.40 Other cochlear malformations in 22q11DS have also been previously reported. Loos et al reported on 2 ears with a large basal turn length.16 One patient described by Devriendt et al13 had a malformed cochlea, where the basal turn was broad and the second and apical turns were short. 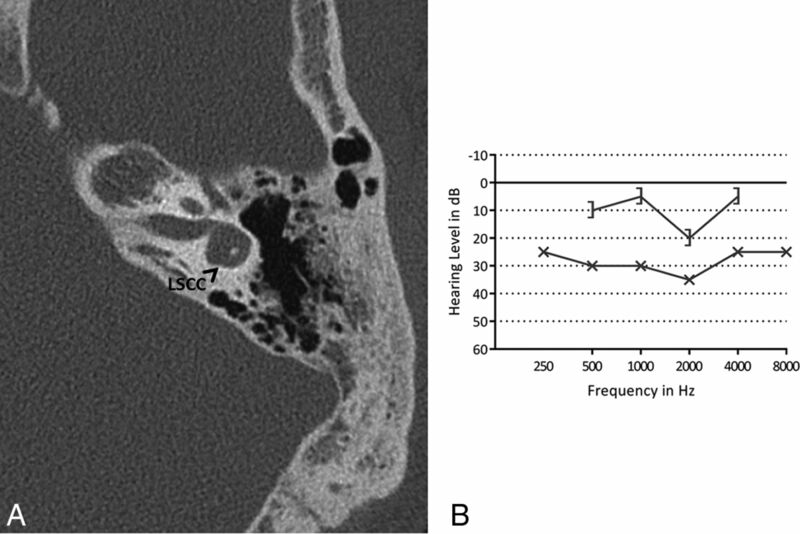 Hearing impaired as well as normal hearing ears were found to have a dense stapes superstructure, incomplete partition type II of the cochlea, or a malformed LSCC in this study. However, the relation between hearing loss and abnormalities of the middle or inner ear was not within the scope of this report because selection bias undoubtedly plays a large role. Due to the retrospective design, patients with hearing impairment are more likely to undergo imaging with CT compared with patients with normal hearing. In fact, the indication for the radiologic imaging in 12 patients was unexplained hearing impairment. We found 5 ears with a dehiscence of the carotid canal. A carotid canal dehiscence is present in approximately 7% of the general population,45,46 in which case our findings suggest a slightly higher prevalence in patients with 22q11DS (10%). In patients with a carotid canal dehiscence, the internal carotid artery is (partly) no longer protected by a bony shield and is exposed in the middle ear. Because patients with 22q11DS often have middle ear infections requiring grommet insertion or even middle ear surgery, otorhinolaryngologists should be aware of the possible presence of a carotid canal dehiscence in patients with 22q11DS. We found 1 ear with an aural atresia affecting both the external auditory canal and the middle ear. This patient may have also had a second genetic disorder. Therefore, in this patient, the aural atresia could have been attributed to a disorder other than 22q11DS. Aural atresia has previously been described in 22q11DS by Derbent et al47 and Digilio et al.48 The patients reported both by Derbent et al and Digilio et al all showed features resembling the oculo-auriculo-vertebral spectrum in addition to 22q11DS.47,48 Patients with the oculo-auriculo-vertebral spectrum show defects in organs deriving from the first and second pharyngeal arch. As a result, aural atresia is frequently observed.49 Also concluded by Digilio et al,48 features resembling the oculo-auriculo-vertebral spectrum could occur in patients with 22q11DS, perhaps more frequently than expected. In addition, 18 ears with a dense stapes superstructure were encountered. We acknowledge that the diagnosis of a dense stapes superstructure is subjective and these results should be viewed with caution. In the literature, we could not find information on a standardization of the CT density of hearing ossicles. However, when analyzing the CT images of our patients, a dense stapes superstructure was relatively easy to detect by visual analysis. Furthermore, Loos et al16 found approximately the same number of patients with a dense stapes superstructure (36% versus 45%). This suggests that this finding may be a feature present in patients 22q11DS, though at present, we do not know its clinical significance. We initially assumed that the dense stapes superstructure was a result of chronic otitis media (ie, tympanosclerosis). However, in the study from Loos et al, 1 patient showed this abnormality on day of life 9. This indicated a congenital instead of a postinfectious cause, as stated by the authors.16 Possibly, the dense stapes superstructures we encountered were also of congenital origin. Moreover, only 3 of the 12 ears with dense stapes superstructures in the present study showed signs of a stiffened ossicular chain on a tympanogram, suggesting a possibly different entity than tympanosclerosis. The main limitation of this study is selection bias due to the retrospective design. Only patients with a clinical indication, most likely unexplained hearing loss or chronic or recurrent otitis media, were likely to have undergone radiologic imaging. Therefore, no realistic prevalence should be extracted from this study. The primary purpose of the study was to describe the more common vestibular and cochlear malformations and to consider associations with balance and hearing problems in those who have 22q11DS. Furthermore, some of the encountered abnormalities, especially the incomplete partition type II, are very subtle. Likely, there would be interobserver variability if the same images were also evaluated by a different team. Cross-sectional imaging of the temporal bones in a 22q11DS cohort of 26 patients is presented and a review of the literature was performed. A dense stapes superstructure, suspected incomplete partition type II of the cochlea, and LSCC malformations were frequently encountered. Future studies in these patients should preferably include vestibular testing because balance problems are known to contribute to motor development delay in children. Correlation between LSCC malformations and vestibular function would be of interest. Disclosures: Donna M. McDonald-McGinn—UNRELATED: Grants/Grants Pending: National Institutes of Health, Comments: grants MH087626 and MH087636 for work outside the submitted work*; Payment for Lectures Including Service on Speakers Bureaus: Natera, Comments: lectures on the 22q11.2 deletion syndrome. * *Money paid to the institution.